You can't challenge or contest a will simply because you don't like its terms. There are four legal reasons for a will contest in most states, and it can be very difficult to prove any one of them. That translates to a great deal of expense in many cases, from attorney's and expert's fees to court fees. But if one of these four reasons for a contest does exist, a last will and testament can be invalidated. It's not a matter of invalidating just one provision. The entire will is effectively thrown out and the estate proceeds as though the decedent had never left a will at all. Each state has very specific laws governing how a last will and testament must be signed. For example, the will must be signed by the testator—the person who created and is leaving the will—in the presence and hearing of at least two witnesses in Florida. The testator and the witnesses must be in the same room at the same time, and each must sign the will while the others are watching. 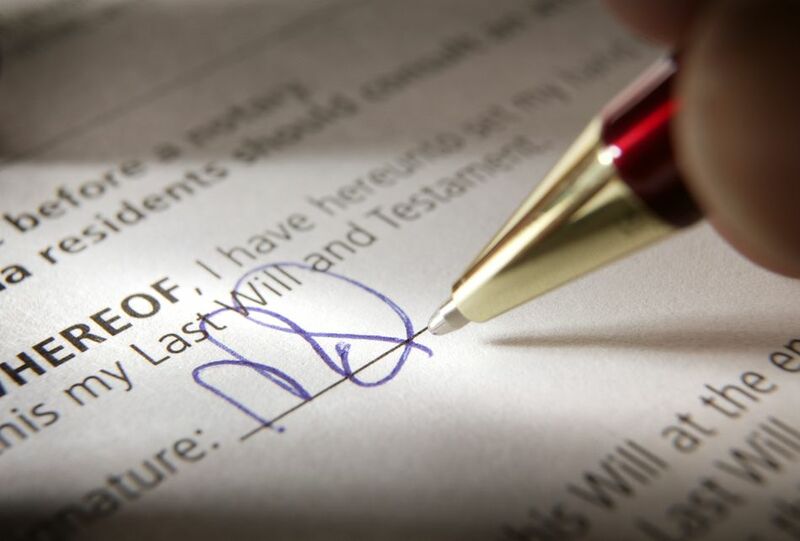 It's easy to assume that a will that's executed in an estate lawyer's office will be signed with the proper legal formalities, but this isn't always the case. Failing to sign a will in accordance with applicable state laws is the first and foremost reason why a will is contested and it's also the most common reason why a will is found to be invalid. "Testamentary capacity" means that the testator understands the nature and value of her "bounty" or assets, and that she understands the natural objects of that bounty—who should logically inherit her assets. She must understand the legal effect of signing a will. State laws dictate the threshold that must be overcome to prove that a testator lacked testamentary capacity, and the bar isn't usually set very high. For example, a person can show signs of dementia in some states yet still be considered to have the testamentary capacity to sign a will. She understands the necessary details even if her memory and mind are slipping in other areas. The testimony of the witnesses to the will signing becomes crucial in cases such as this. Absent a doctor's visit or an adjudication of incapacity within days of the will signing, lack of testamentary capacity is very difficult to prove. People tend to become weaker both physically and mentally as they age, and this can make them more susceptible to the influence of others. The key to undue influence in the context of a will contest is this: Did the alleged influencer exert such extreme pressure and put the testator under such severe duress that it caused him to lose his free will and instead succumb to the will of the influencer? Mere nagging, threats, and verbal abuse aren't enough to establish undue influence. Proving it typically involves actions such as consulting with the testator's attorney regarding the provisions of the will, paying for the will, and isolating the testator from his family and friends. As with lack of testamentary capacity, undue influence is very difficult to prove. A will procured by fraud is one that the testator is tricked into signing. For example, the testator might be presented with a document and told that it's a deed or a power of attorney. She therefore signs it, but it turns out that the document is a will. The will is therefore procured by fraud. This tends to go hand-in-hand with testamentary capacity because most people would review the document, at least to some extent, before signing. But fraud is nonetheless a separate ground for a contest. The problem with proving that a will was procured by fraud is that the testator can't be questioned about what he thought he was signing, and this is where state laws come into to play. The witnesses must be asked what they thought the testator was signing. The will might be declared invalid if the testimony of the witnesses doesn't add up, but more likely because it wasn't signed properly, not necessarily because it was procured by fraud. Do You Want to Contest a Loved One's Will? In the absence of blatant lies and wrongdoing on the part of multiple people, or explicit medical evidence at or near the time the will was signed that the testator was incompetent, proving that a will is invalid can be difficult and very expensive.